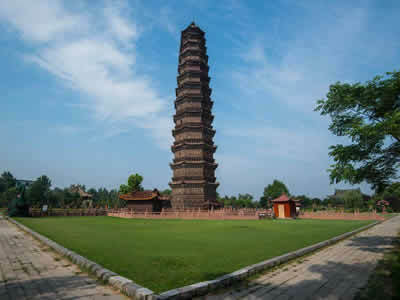 In this Itinerary, tourists will visit 6 famous cities in Shaanxi Province and Henan Province (the Central Plains of China) – Xi’an, Luoyang, Dengfeng, Zhengzhou, Kaifeng and Anyang. Except Dengfeng, the spiritual "Centre of Heaven and Earth", other 5 cities are among 8 historical capitals of China. * Appreciate the marvel of China Ancient Metallurgical Technology – Copper Carriage for the emperor Qinshihuang around 2300 year ago and the Worlds No.8 Wonder – Terracotta Warriors. You will make your own way to the railway station in Shanghai by yourselves, taking the bullet train from Shanghai to Xian. In around 7 hours, you will meet your local guide and driver at the railway station in Xian, and transfer service to your hotel in downtown Xian. After Dinner, drive for around 76km/1.5 hours to Zhengzhou, the capital of Henan Province. After around 1 hour’s sightseeing at the Lane City, you will hop aboard your van and drive north for around 20km/40m to Anyang city to visit the famous UNESCO World Heritage - The Museum of Yin Ruins (Or translated as Anyang Yin Xu Museum). You will feast your eye on the exquisite collections unearthed in Yin, the capital (1300–1045 BC) of the Shang (Yin) Dynasty here and appreciate the foundation sites of the emperor’s palaces, royal temples and the capital layout design around 3300 years ago, especially the only one remained intact Tomb of Fu Hao. Fuhao is one of the reigning wives of King Wu Ding whose reign lasted from approximately 1250 to 1192 BC and continued to use Yin (current Anyang area) as his capital and launched numerous military campaigns from this base (many led by Fu Hao, who was both a general and a high priestess) against surrounding tribes thus securing Shang rule and raising the dynasty to its historical zenith. In the evening, drive for around 200km/2.5 hours back to Zhengzhou and overnight in Zhengzhou.